When asked to choose the court decision they found most interesting and significant two UBC law students serving as interns in the Provincial Court selected the same Supreme Court of Canada case. Can you guess what case they chose? UBC’s Allard School of Law offers students an opportunity to spend one term as interns in the BC Provincial Court. They do research for and are mentored by judges, and reflect on their experiences in class discussion and reports. It’s a win-win situation. The program gives students a unique perspective on the court system and judges find exposure to the students’ energy and enthusiasm stimulating and refreshing. One thing both judges and students agree on is that the law is not dull. This spring students were invited to suggest cases they find both interesting and important for an eNews article. Both Chelsea Tenant and Jennifer Lang-Hodge wrote movingly about one case. “In 1922, Emily Murphy, as Canada’s first female magistrate, was a highly accomplished professional. However, when her name was forwarded for a Senate appointment, she was rejected. Parliament asserted that, as much as they would like to appoint her, they simply were not allowed. The British North America Act only allowed qualified “persons” to become Senators, and women were not “persons”. Unwilling to accept this, Emily Murphy gathered four more women activists. These women, known as “the Famous Five” petitioned the Supreme Court of Canada to interpret whether women were “persons”. The Court ruled unanimously that when the Act was written in 1867, “persons” was understood to include only men. Thus, the Act was clear that women were not “persons” and could not be Senators. “This case is not only significant because of what it has done for women’s rights in Canada, but also for what it has done for Constitutional Law through its creation of the “living tree doctrine”. These two aspects of the case are interrelated, and demonstrate how important it is to view the Constitution as something that must adapt to reflect society, rather than be confined to outdated norms from the nineteenth century. Reading this case opened my eyes to what women only 100 years ago had to endure. I cannot imagine being told that I am not a “person” and so am limited as to my role within society. Thanks to these women I have never been told such a thing, and am able to study law knowing that I have the ability to become a lawyer, judge, senator, or Prime Minister. On October 18, 2000 the Women are Persons! 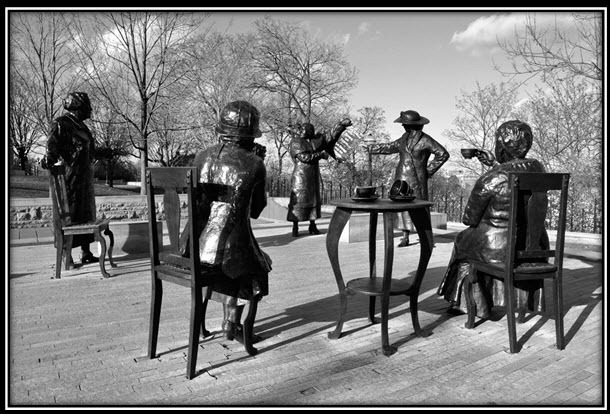 Monument shown here was unveiled to commemorate the Persons Case and the Famous Five: Emily Murphy, Henrietta Muir Edwards, Nellie McClung, Louise McKinney, and Irene Parlby.